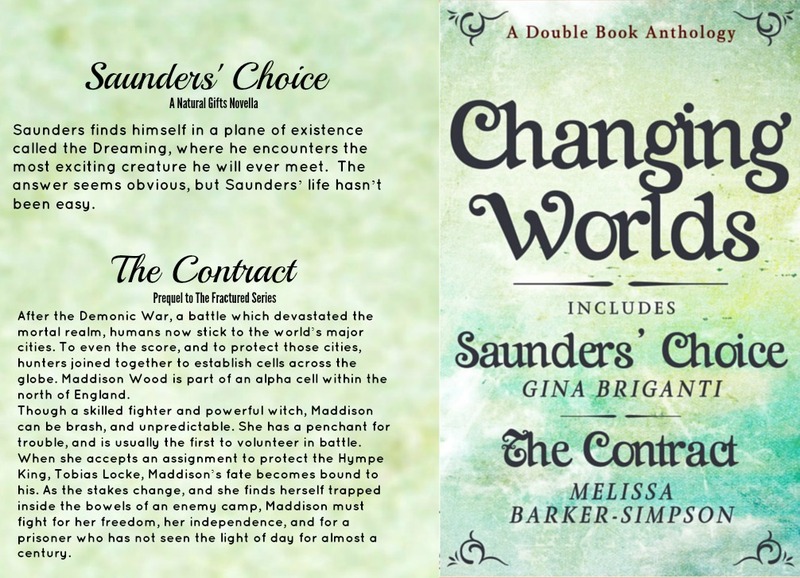 It’s Release Day for Changing Worlds by Gina Briganti and Melissa Barker-Simpson! What started as a desire to collaborate with another author turned into a dream of satisfying proportions. Some would say I’m easy to please, and though at times I know they’re right, I am demanding when it comes to what I put my name on. Melissa Barker-Simpson can back me up on this, I’m sure. We are thrilled to our very tippy toes to share our creation, our first anthology, Changing Worlds. Melissa and I each wrote a story for one of our series. I chose to set my story entirely in the Dreaming for the first time, and see what Velvet (my lovely mermaid was introduced in The Dreaming, Natural Gifts book 1) was in store for where romance was concerned. My story is titled Saunders’ Choice. Saunders finds himself in a plane of existence called the Dreaming, where he encounters the most exciting creature he will ever meet. The answer seems obvious, but Saunders’ life hasn’t been easy. Melissa’s story, The Contract, is a prequel to her new series, The Fractured. I’ve had the pleasure of reading it several times, and I can’t wait to share it with all of you! Changing Worlds is available now from Amazon in paperback form, and from Smashwords, and Kindle, in eBook form. As always, thank you for sharing in my excitement! I hope you’re signed up for my newsletter, but if you’re not, you can sign up for it by clicking here. It is! Thank you for sharing our special day. What can I say to that except to reflect all of that back to you. So much fun! Mazel Tov to both of you! Thank you for your support, Sally! If you or both of you would like to do a guest post about this project (how it came about, how you know each other, what your collaboration process consisted of, etc., any or all of the above) and promote it, Wednesdays are my Guest Blogger days! Send me some dates that work for you and I’ll send you more info, or you can find the “Guest Bloggers’ Hall of Fame” page on my site, here, and check for open dates and the Guidelines are at the bottom. Best to you both, Gina! Thank you, Sally! We’ll see what might work for us. I’m really excited for you Gina. Congratulations to the both of you. I’ll be sure to share your news.